Today, Apple unveiled the 2016 edition of its annual Best of App Store lists for iPhone, iPad, Mac, Apple Watch, and Apple TV. The lists highlight the best apps and games released by third-party developers on each platform during the past year. The top picks this year for each platform are Prisma (iPhone), Sketchbook Motion (iPad), Bear (Mac), MySwimPro (Apple Watch), and Twitter (Apple TV). The games of the year are Clash Royale (iPhone), Severed (iPad), Life is Strange (Mac), Field Day (Apple Watch), and Riptide: GP Renegade (Apple TV). 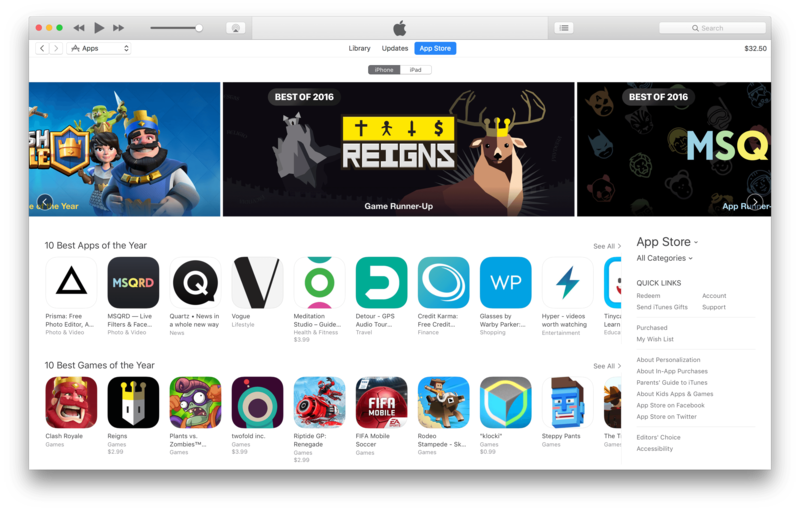 In addition, this year Apple published lists of the '10 Best Apps of the Year' and '10 Best Games of the Year' on the iOS App Store and Apple TV App Store, and an extended list of the 'Best Apps & Games of 2016' on the Mac App Store. Like last year, Apple has picked a mix of paid and free apps from developers big and small. Among the notable indie picks are apps from Shiny Frog, Devolver Digital, and Drinkbox Studios. A recap of all the winners and runners-up (from the US App Store) and links to MacStories reviews where applicable is available below.